The New Adventure of Gumby: The 1980s Series, Volume 1 * Re-Mastered With Improved Video and Sound! 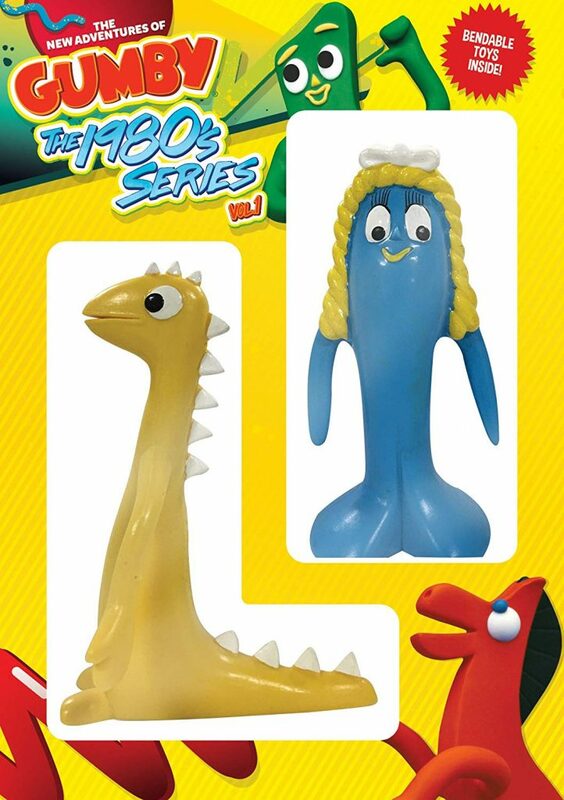 This limited edition includes bendable Prickle and Goo figures as we welcome back Gumby and Pokey in this wild, wacky and inventive collection of ’80s episodes. Featuring 50 clay-animated episodes, fully re-mastered from their original camera rolls and soundtracks. Also making appearances are Prickle, Goo, the Blockheads,Professor Kapp, Dr. Zveegee, the Moon Boggles, and Gumby’s parents Gumbo and Gumba. New characters include Gumby’s sister Minga, Denali the Mastodon and Tilly the chicken! KIDS FIRST! Film Critic Nathalia J.comments, “Did you know that each episode and song was fully re-mastered from the original camera rolls and soundtracks? How cool is that! Here’s a chance to see Gumby as it has never been seen before.” Benjamin P. adds, “The New Adventures Of Gumby: The 80’s Series is a good show that retains the groundbreaking animation and immense amount of creativity at the forefront of past iterations of Gumby.” KIDS FIRST! Adult reviewer Rachael V. wraps it all up with, “Having been a fan of the original Gumby series, I enjoyed seeing my favorite characters rejuvenated on screen with better film quality and sound. The stories are always so eccentric and fun-loving and this collection is no different.” See their full reviews below. This lovely two DVD set comes with limited edition bendable Prickle and Goo figures. How awesome is that! The 1980s show was a hit when mom was growing up and it bought back so many memories for her. Welcome back Gumby and Pokey in this wild, wacky and inventive collection of 80s episodes, created and written by Joe Clokey.My favorite character is, by all odds Gumby, because he is always so energetic and happy. I enjoyed watching how Gumby and his genial friend Pokey take an adventure through an Ice Cave. I enjoyed this mirthful episode because it made me laugh. I really enjoyed seeing the characters come to life.The colors also really bring a sense of enjoyment.The characters in this series are Gumby, Pokey and Prickle, an adorable yellow dinosaur that looks like a dragon. Also making an appearance are Goo, the Blockhead, Professor Kapp, Dr. Zveegee, the Moon Boggles and Gumby’s parents, Gumbo and Gumba. I have to tell you about the story behind this release. Did you know that each episode and song was fully re-mastered from the original camera rolls and soundtracks?How cool is that! Here’s a chance to see Gumby as it has never been seen before.I give this DVD 3.5 out of 5 stars and recommend it for ages 3 to 7, as well as adults.This series is certainly unique and will definitely bring back memories if you grew up watching Gumby. This DVD is available now so, check it out. The New Adventures Of Gumby: The 80’s Series is a good show that retains the groundbreaking animation and immense amount of creativity at the forefront of past iterations of Gumby. This DVD contains over 40 episodes that follow the vivacious chunk of green clay named Gumby and his friends – Pokey, Prickle the little yellow dinosaur and a blue flying mermaid named Goo. Gumby can go anywhere,including inside books, and turn into anything. The crew goes on lots of fantastical and quirky adventures together. One of the things I enjoy about this DVD is its diverse set of characters. This collection has all the favorite characters from the previous series such as The Blockheads and Professor Kapp.My favorite character from this collection is Gumby. This altruistic do-gooder is a character whose values are something kids can aspire to adopt. Gumby is one of the few characters that, if we all aspired to be, the world would be a better place. He ivery likable and consistently fights for the common good. I also really like Gumby’s friends. This collection also highlights how pivotal these characters were to the series’ success. I really enjoy Gumby as a character, but without Prickle, Goo and Pokey as foils and characters for him to interact with, this series just wouldn’t be as good. I really have to give credit to the animators for using Claymation and not going with another type of animation. When such a specific brand like Gumby is been created and such dynamic characters are established, it’s difficult to divert from the Claymation style. The difference here is I can tell that the character models and the environments have improved from the 60s, but the show doesn’t lose the charm of the Claymation format. I recommend The New Adventures Of Gumby: The 80’sSeries for ages 6 to 8.These are short cartoons that match younger kids’ attention spans. The episodes are extremely colorful, but I think kids underage 6 won’t understand the jokes. I give it 3 out of 5 stars. I didn’t find this collection as compelling as the 60s series, but it carries the torch of the Gumby legacy well. You can find this collection on DVD now. This lovely collector’s edition comes with two bendable toys that are two new lovable characters from this Gumby DVD. The characters are Prickle, a cute yellow dinosaur/dragon and Goo, a green gooey mermaid. Having been a fan of the original Gumby series, I enjoyed seeing my favorite characters rejuvenated onscreen with better film quality and sound. The stories are always so eccentric and fun-loving and this collection is no different. My favorite episode from Volume 1 is Birthday Party in the Middle Ages. During this story, Gumby and friends are invited to King Ott’s birthday party from the middle ages book. 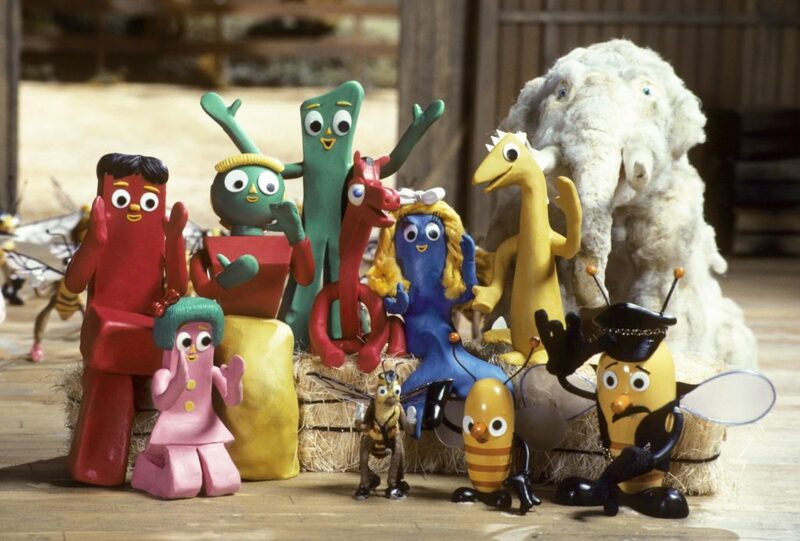 I love seeing all of these characters brought to life in true Gumby form; the shapes and colors are fantastic. This DVD is captivating for the younger ages. I recommend it for ages 3 to 7 and give it 5 out of 5 stars for its timelessness.